If you are working away from home or having a weekend away then The Three Horseshoes is just for you. A picture of olde world charm, The Three Horseshoes is adorned with oak beams and a magnificent centre fireplace and at over 200 hundred years old is one of the oldest buildings in the village. Situated between Milton Keynes, Aylesbury and Leighton Buzzard, we are ideally situated for access to any of the main towns, Easy access to London via the M1 and a wide variety of local attractions including Silverstone, Woburn Abbey and Safari Park and Whipsnade Zoo. We have nine bed and breakfast rooms ranging from singles through twins and doubles, some also including ensuite bathrooms. All have tea and coffee making facilities, colour t.v. and radio alarm. Basic room with 1 double bed. Shared bathroom facilities. Basic room with 2 single beds Bathroom facilities are shared. We are situated in Drayton Parslow, a small village approximately 15 mins from Milton Keynes centre. We can be easily found from the A421 from Buckingham or the A5 from Milton Keynes. 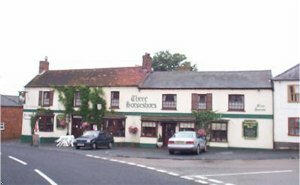 The Three Horseshoes kitchen is open from 12.00 -2.00 Tuesday to Sunday and 7.00 - 9.00 Monday to Saturday. We offer a bar snack menu and an evening menu for your choice, including fish dishes, pasta and our Chefs speciality steaks.